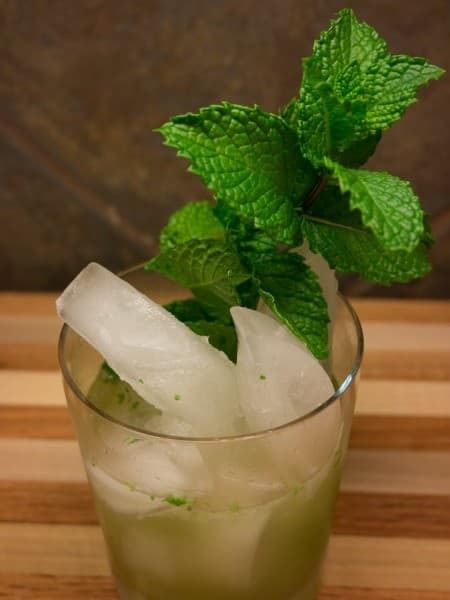 Shake everything moderately hard except one sprig of mint with ice cubes. Strain onto new ice cubes in a glass. Garnish with the third sprig of mint. Very similar to a julep, a Gin Smash is shaken with mint instead of muddled and stirred. The end result will have little bits of mint floating in the drink. If you don't want these little green flecks go ahead and double strain the drink. I like the little floaties so I leave them in. A Gin Smash should be shaken but not too excess. Don't shake like you're trying to break up an egg white. If the mint gets "smashed" too much it will bring out it's bitter and vegetal flavors as opposed to the sweet mint oil that you want. I have a note calling for Holland gin (genever) in this recipe because that's what Jerry Thomas meant when he calls for "gin" in his recipe in 1862. I have found that the delicate genever (Bols) I was using didn't stand up too well to the shaking and dilution. Perhaps Jerry Thomas was using a hearty oude genever that could stand up better. I have enjoyed Holland gin in cocktails, crustas and punches but these are all stirred. Maybe I have "bruised" the gin? Next time around I will try Old Tom or London Dry gin and will report on the results. If anyone else has already done so please report your results below.